A General Plan is required by Utah State law in 10-9a-403 of the Utah Code Annotated. The statute says, “The planning commission shall make and recommend to the legislative body a proposed general plan for the area within the municipality”. While some of these studies and documents have focused on specific problems and concerns, they all share a common thread or relationship to land use planning in Oakley City and all play a valuable roll. This document is not intended to commit the City Council or Planning Commission to specific courses of action, but to rather clearly define the end products which the City desires to attain. Certain ordinances, including mainly, the Oakley Land Management and Development Code will put many of the objectives outlined in this General Plan in a Code form that may be interpreted and implemented or applied by the Planning Commission and uniformly enforced by the City Council. It is important to understand the relationship of the General Plan to the Zone District Map and the Land Management and Development Code. While similar, they are not the same. The General Plan provides a general direction in terms of land use the City hopes to achieve over time. It has been developed with an eye toward the future rather than for the purpose of current regulation. The zoning map and the Land Management and Development Code represent local regulations, as they exist at the moment. It is anticipated, however, that the zoning map and development code will be adopted or revised in conjunction with the implementation of this General Plan to help codify the objectives and policies of this plan. The development code and zoning map may need further revisions and/or additional ordinances to achieve the full intent of this General Plan over time, but this continuing process of refinement and improvement to City Codes is proper and desirable to ultimately achieve the goals of this General Plan. 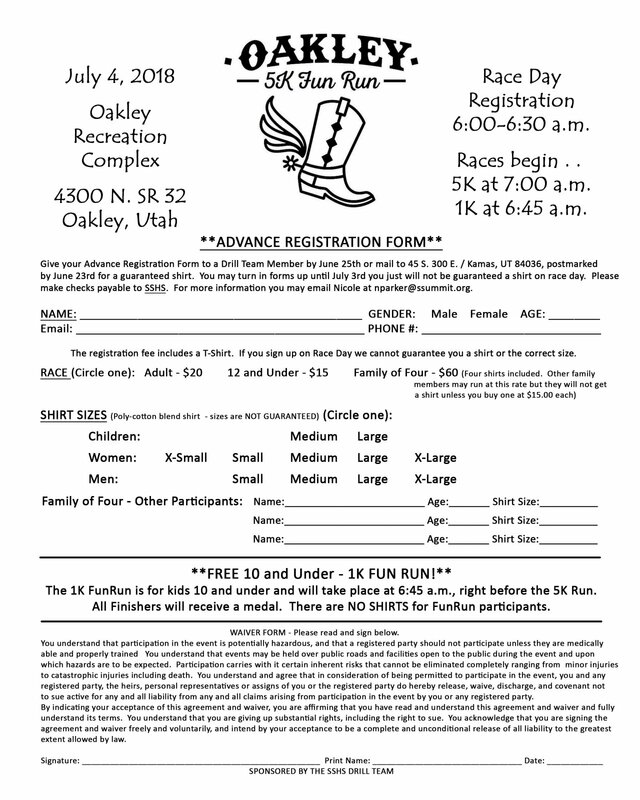 Oakley City is a community rooted in a deep-seated work ethic, an ethic brought to the Uinta mountain valley by ranchers and farmers over one hundred twenty years ago. That pioneer spirit has carried through to present and is what makes Oakley such a pleasant place to live and work. The Oakley 4th of July Rodeo and Celebration has continued for over 72 years and has become nationally famous. People travel from all over the country to see “one of the best little rodeos in the USA”. The celebration is an achievement of hundreds of hours of donated time by “City folk”, with all profits going back into the City coffers. This results in Oakley having one of the lowest property tax rates in the State of Utah. Oakley has experienced only moderate growth since its meager beginnings in 1886, originally known as a community on the Weber River called Oak Creek. Figure 2.0 shows recent actual and projected population growth rates of the City. The projections are from the Governors Office of Planning and Budget and were provided in early 2008. Summit County and its Cities have the task of dealing with rapid expansion, caused by two main factors. First, Park City, a well known and publicized ski resort City that attracts people from all over the world to recreate on its famous ski slopes places Summit County on the international map, and second, its close proximity to the Wasatch Front (20 to 40 minute drive time by a major interstate). This makes eastern Summit County an ideal bedroom community for both the greater Park City area and the Salt Lake vicinity, but causes type urban growth in this part of the county preferred for its rural-agricultural lifestyle and services. This “bedroom” type growth impacts public services severely and does not usually pay for its fair share of the public infrastructure improvements needed by the development. The growth impacts hit the new homeowners pocket book, but not nearly as hard as the impacts on the long time residents of the cities. These same problems are amplified even more so in Oakley’s situation, a long time small rural City faced with the prospects of becoming a much more urban city in the next 10 to 20 years. The new growth also brings with it higher property values, thus inflating artificially the property taxes on long time residents. Higher property values and costs of development can attract even more upper and upper middle class to the rural farm region and may intensify socio-economic differences between different classes of wage earners. Over time the new residents will demand public services more in line with the services they received in their previous high population community. Many long time residents of Oakley would be very satisfied with simple and cost efficient services, or services more in line with what they grew up with. Development restrictions or growth pressures now in effect in the western portion (Snyderville Basin) of the County will push many from that area into Oakley at an even higher rate that really is unpredictable by conventional planning methods. Oakley is unfortunately becoming closer and closer to Park City and the Wasatch Front through infill developments. It will be a challenge to not become a suburb of these areas in the future. It is no wonder then, that the overall goal or vision of this General Plan is to preserve our agricultural heritage and farm community spirit. Preserving also, the accompanying open space, clean air and clean water that our families enjoy for as long as possible. THE OAKLEY CITY GENERAL PLAN WILL GUIDE FUTURE DEVELOPMENT FOR ORGANIZED GROWTH, INDUSTRY, BUSINESS AND EMPLOYMENT OPPORTUNITIES AND WILL ENSURE THAT THERE WILL BE ADEQUATE PUBLIC FACILITIES AND SERVICES. MOST IMPORTANTLY, THE IMPACTS OF GROWTH WILL BE HANDLED IN A WAY THAT SEEKS AS ITS PRIME GOAL, TO PRESERVE THE OAKLEY QUALITY OF LIFE, PRESERVATION OF ITS NATURAL RESOURCES, PRESERVATION OF IT’S RURAL LIFESTYLE AND ENHANCEMENT OF ITS COMMUNITY PRIDE AND VALUES. THE PLAN WILL ALSO PROVIDE, TO THE BEST OF ITS ABILITY, THAT THE VERY PEOPLE WHO HAVE INVESTED THEIR TIME, SWEAT AND MONEY TO MAKE OAKLEY A CHOICE PLACE TO LIVE, WILLNOT HAVE TO CARRY THE GROWTH BURDENS OR PAY FOR THE IMPACTS OF NEW GROWTH. Oakley zoning and development ordinances and maps should be revised, updated and/or amended to reflect the General Plan’s goals and intentions. Rural, agricultural and some urban design issues should be addressed in and enforced through these ordinances. Other City ordinances and policies should be revised, adopted or amended based on the General Plan goals and policies. This General Plan should specify policies to fulfill the spirit of the goals and objectives listed herein. All requests for re-zoning or annexation should be considered in light of the land use goals and policies of this General Plan. If land proposed to be annexed cannot blend into and enhance these Plan objectives, it should not be considered for annexation. Capital improvements for public services and facilities should be planned and developed in a way that is closely tied to this General Plan goals and policies. Construction of utility infrastructure, municipal buildings, schools and related facilities, parks, roads and drainage systems, should follow the guidelines of this General Plan. Because this General Plan is to be used to guide development according to the aspirations and needs of the community, the viability of the plan rests in its adaptability to changing conditions. The process by which the General Plan text and Land Use Map may be amended will help ensure that zoning decisions and plan objectives and policies are based on adequate research and input rather than on special interest or expediency. The amendment process is set forth in the following goal, objectives and policy statements. TO ENSURE THAT THE OAKLEY GENERAL PLAN IS ADAPTABLE AND RESPONSIVE TO THE GOALS AND VALUES OF THE OAKLEY COMMUNITY. Encourage the regular review, update and refinement of the General Plan. Require the overall evaluation and update of the City’s General Plan every 3 to 5 years, or as significant changes in the community occur. Allow General Plan revisions through addition, amendment or deletion. · Applications, identifying the section of the General Plan for which the amendment(s), deletions and/or addition(s) are sought, may be submitted to the City Planning Staff. · Relevant data is collected and analyzed by the City staff or other appointed person(s). · Data is presented to a City General Plan Committee if organized, or the Planning Commission if there is no need for a study committee. The findings will be submitted for study to the Planning Commission. · The Oakley Planning Commission will make a formal recommendation to the City Council. · The City Council may conduct a public hearing to receive additional comments on the proposed changes. Following the public hearing, the City Council may take action to approve or deny the proposed changes to the Oakley City General Plan. Encourage and foster continued citizen participation and input on all civic issues. Implement a program of community awareness, possibly through a newsletter or flyer attached to water/sewer bills. Publicize the goals and concepts of the Oakley General Plan and make the plan readily available to the public. Create when necessary, and when created, maintain and support the functioning of an Oakley City General Plan Committee. This group will be made up of a workable, reasonable number of residents as are interested in participating in planning issues. The main challenge in dealing with growth and development is to ensure that adequate public services and facilities are in place prior to completion of the development. These services include fire, ambulance and police protection, water and sewer services, roads, parking, street lighting, snow plowing and storm drainage, schools and school bus services, pedestrian access ways, parks, rodeo and recreation facilities. Planning and zoning, as well as City administrative services are also necessary. Other services include power, telephone, cable television and natural gas. Care must always be taken so that the rate of development does not exceed the capacities of the entities which provide the services. PROMOTE AND ENSURE EXPANSION AND DEVELOPMENT OF PUBLIC SERVICE FACILITIES AND INFRASTRUCTURE WITHIN THE OAKLEY AREA THAT WILL FIRST, SUPPORT THE EXISTING RESIDENTS AND BUSINESSES SAFELY, AND SECONDLY THE PLANNED GROWTH OF THE COMMUNITY. ALSO, TO ENSUREFUTURE PATTERNS OF DEVELOPMENT AND LAND USE THAT REDUCES THE INFRASTRUCTURE CONSTRUCTION COST AND OPERATION AND MAKES EFFICIENT USE OF EXISTING OR PLANNED FACILITIES. Require development to be timed and sequenced in a manner consistent with the capacity of available public services and facilities. All development, including all of its futures phases, must ensure that all services required for the development are in place or constructed concurrently with the project. All required service must be useable by completion of the development. Procedures are to be outlined in the Land Management and Development Code. All on-site and/or off-site improvements must be bonded or otherwise guaranteed so that they will be completed satisfactorily and on schedule and adequate guarantees must be in place before the Mayor signs the final plat(s). Require new development of greater than 5 lots, to be evaluated on the impacts on the public facilities that would result from the development. A detailed public infrastructure review and study process is to be included in the Land Management and Development Code that the developers of new projects must perform. A review process by the public service providers of the impacted services will also be provided. Refine the development review process in the Land Management and Development Code so that the availability and capacity of public services is a major consideration for permitted, conditional and discretionary uses of land or developments. Require Development to pay its fair share of the impacts created on public facilities required for the development. All on-site public infrastructure and related facilities required by a development will be constructed under City standards and specifications and paid for by the developer. All off-site public facilities’ improvements which are required exclusively to achieve capacity or supply for the new development, will be paid for by the developer through impact fees or special assessments. A fee resolution or ordinance will be developed by the City to pay for City costs associated with review, outside planning, engineering, planning and zoning, conditional use permits and other administrative related costs, copies of codes and general plans. Also, impact and development fees for water, sewer, public safety, roads, other infrastructure and schools may also be included and adopted. This resolution will be updated or reviewed on an annual or other regular basis. Involve interested and affected entities in the City review process for new developments. These agencies should be on a sign off list or on a signature block on any plats to ensure that they have enough data to plan for impacts and required improvements to their service(s). Require developers and/or public service providers to attain adequate capacity to serve the community through planned capital improvement programs. Develop a City capital improvement program for water, sewer, roads, parks and recreational facilities. Establish detailed criteria, service priorities and responsibilities of establishing and implementing the program. Use this plan as a device to formulate and regulate impact fees, and improvement standards for new developments. Build closer working relationships between the various entities that provide services to the Oakley Area to ensure that their service capabilities match the City’s growth expectations. A full range of services, such as education, fire protection, police and health should be considered. Work with other service providers, including the South Summit School District, Fire District and Summit County to facilitate the collection and distribution of impact fees for their respective services. Work with them in planning as well as implementation of their services to better serve existing and future customers of the City. Coordinate with service entities to develop long range plans for the sequencing of development so that development is not allowed to create a patchwork or island(s) of service facilities that are inefficient and expensive to service or operate. Require developers who provide their own water for their development or are transferring water to the City’s water sources to prove the availability of “wet” water. This proof should insure that the water is not seasonal water and is in a quantity and quality that meets State health department and City standards for delivery of water service. Implement the suggestions of the City Water Master Plan and Reservoir Site Study and update the Wastewater Management plan to meet future estimates of growth in the City. Prioritize and begin a capital improvement plan for the next 10 years to develop the Water and Wastewater system improvements detailed in the Water Master Plan and updated Wastewater Management Plan. Improvements should be accomplished as needed currently and by future needs on a fee schedule that would not overburden existing customers of City Services. On an annual basis, review and update, if necessary, the water and sewer fee resolutions to keep up with current and future growth demands as well as new water quality regulations. Design services so they do not create a high operational and financial burden on the City, either currently or in the future. All development projects, including individual structures on any current lot of record must pay for the total cost of required extensions of water and/or sewer services to their project, regardless of the distance required. Such extensions may include pipelines, valves, fire hydrants, pressure regulation valves, pumping or boosting facilities, manholes, vaults, clean-outs and storage systems if needed. All facilities must be built to City standards and specifications and guaranteed as per any current City codes. The costs of these extensions are in addition to any impact fees required for the development. Impact fees go toward developing general City infrastructure impacted by growth and acquiring water rights. The owner and/or installer of the facilities may enter into “aid to construction” agreements with the City, if the City decides that they should participate (at the City’s discretion) and upgrade the size or capacity beyond that needed for the project and its users. This enlargement would be for future service areas or capacities, and the City would pay the costs of the added capacity as per the agreement. The minimum sizing of the system must however meet the current City standards for that area. The City and the Developer may also enter into agreements to recoup the cost of proportionate shares of the improvements as connections are made to the extension by future growth. The developer or the City or a combination of the two, depending on which entity(s) paid for the improvements, may enter into the agreements. The recovery period shall not exceed 7 years and only future connections, between the last termination of the City facilities and the end of the new extension may be recovered. Extensions added to the end of the facilities (designed to extend the services in the same manner as the previous extension) are not contributable to the original extension parties. Coordinate with Summit County officials to ensure that growth around Oakley City occurs in a manner which allows the phased extension of services so that the creation of overlapping service districts and inefficient delivery of services are avoided. Enter into an inter-local agreement with the County to ensure that developments around the City meet the intentions or objectives of this General Plan and will not jeopardize the servicing of City residents in the future. It should be assumed that the area within a half mile of current City boundaries or within the current annexation declaration could impact the City or its quality of life, whether the City has a schedule to annex that area or not. These areas should be jointly studied by the City and the County to decide whether it would be desirable to annex the development territory, even if it is not defined or classified as “urban growth”. Assure the city’s Annexation Declaration is in accordance with the Utah State Code, and provide a copy of the Declaration to Summit County for coordinated planning. When annexations are proposed, Oakley City will contact Summit County for input regarding the annexation and it’s boundary, so as to minimize the negative affects of annexing property. When appropriate, Oakley City will encourage annexation of whole parcels of land, so as not to create illegal land divisions or isolated islands of land. The location of land uses, green spaces and intensities at which various uses are developed and managed is the most visible element of a General Plan. Oakley’s mountainous geography, river valley setting, agricultural terrain and heavy snowfall impose natural constraints on the location of activities. Development must be undertaken in a careful manner in order to not destroy the natural features which are used and enjoyed by the agricultural and residential community alike. ENCOURAGE CENTER OF CITY OUTWARD DEVELOPMENT WITH A RESPONSIVE GROWTH MANAGEMENT PROGRAM THAT PRESERVES THE SMALL TOWN SETTING AND SENSITIVE LANDS OF THE CITY AS WELL AS PROVIDING A DIVERSE MIX OF COMMERCIAL, RESIDENTIAL HOUSING AND SOME MINOR LIGHT INDUSTRIAL USES WITH AGRICULTURAL LAND USES TAKING THE HIGHEST PRESERVATION PRIORITY. Create land use areas or zones that will support higher density uses in the center of City and will reduce in density toward the boundaries of the City, thus preserving the “ community identity” of Oakley City. Ensure responsible growth in the City through provisions that require available and adequate public services and facilities which exist at the time of the development impact. Implement land use management strategies such as agricultural preservation techniques, transfer of development rights and conservation subdivision regulations that preserve the natural setting and resources, and the community character of the Oakley area while providing opportunities for coordinated growth and development. Designate areas for commercial, light industrial and manufacturing uses that will provide employment, tax base and service needs of the community. Provide for mixed housing land uses, including single-family housing that is developed according to the Development Code. Require Green Space Design, clustering, conservation subdivisions and/or density zoning rather than scattered housing on large fixed lots that tend to reduce the amount of green space and farmable land. Such development with housing on smaller lots while maintaining low overall densities also can reduce the cost of services and the amount of water necessary to irrigate the disturbed land on the lot. Include “Right to Farm” provisions in the Land Management and Development Code that would protect the right of the farmers and ranchers to operate their facilities in Oakley without infringement on traditional land and irrigation accesses and uses, or subjects them to complaints regarding noise, odors or length of work hours. The provisions should protect property rights and safety of residents and livestock by providing buffers and or screening as necessary. Provide a minor subdivision ordinance that will make it much easier for subdivisions of less than 5 lots to be developed if they maximize open space, need no public street expansion or improvements or other major infrastructure and meet the goals of this General Plan. Provide strategies by which land may be preserved for future development, through temporary agricultural use while allowing clustering of lots within the density standard. Said preserved land may not be rezoned for further development without demonstrating compliance with the Land Management and Development Code and this General Plan. Rather than making agricultural uses the starting point for rezoning conversion to more urbanized land uses, provide for transitional land use zoning which buffers productive agricultural land. Discourage second or seasonal home developments in the City, especially those similar to poorly planned projects found in Weber Canyon. Undesirable characteristics of such communities include; gated areas, high fire danger, unsafe single or steep access, long narrow private roads, large scattered or interspersed housing, cheap and poor cabin type architecture(s). underdeveloped/seasonal or private water systems and poor visual road cuts/fills on hillsides. The General Plan Land Use Map is a representation of either current or desired land uses in Oakley. The land use designations do not represent existing zoning. The map supports the goals and policies of this General Plan. A map overlay depicts the City’s existing and future parks, green spaces, trails, sensitive and/or hazardous lands, and other public uses. The Land Use Map, in conjunction with these written goals and policy statements, should be used as a zoning decision-making guide, which encourages orderly growth and compatibility of zones and land uses. The Oakley City Land Use Map also indicates desired land uses for areas not presently within the City boundaries. These areas along the boundary lines are included in the current annexation declaration on file with Summit County and may possibly be sought for annexation if the land use proposals in these areas are compatible with current City Goals and Policies. The Country Residential agricultural areas are established to provide areas where the growing of crops and the raising of livestock can be encouraged and supported within the City. The character and essence of Oakley City is our Agricultural areas and all efforts to protect these areas should be encouraged. These areas are intended to protect agricultural uses from encroachment of urban development until such time as residential, commercial or industrial uses in such areas become necessary and desired by the City. Uses permitted in these areas, in addition to agricultural uses, must be incidental thereto and should not change the basic agricultural character of an agricultural environment. Conversion of the Agricultural uses to more urban type uses should be accomplished only in an orderly and careful manner following the General Plan, with no "leap-frog" encroachments of such urban uses or developments into the surrounding agricultural areas. Those agricultural uses existing in other zones that are grandfathered may continue, provided that the land remains unchanged. Residential zoning in this area is one dwelling unit per 40 acres or one dwelling unit per 20 acres. The Very Low and Low Density Residential areas are established to provide areas for the encouragement and promotion of an environment for family life by providing for the establishment of one-family detached dwellings on individual lots and associated uses. This land use zone is characterized with attractively landscaped or naturally rural lots, with lawns and shrubs and natural green spaces. Home densities for Very Low Residential are one dwelling unit per 5 acres and Low Residential is one dwelling unit per two acres or one unit per acre. Medium Residential areas allow two to four single family homes per acre. In some designated areas, Multi Family Residential buildings may be established to provide a residential environment within the City which is characterized by multi family structures and associated uses. This land use is intended to have a residential density slightly higher than the low density residential area, but to maintain a residential character. This land use would be for commercial endeavors with light to moderate public traffic. The main area suitable for this use is the inner commercial block of Oakley as designated on the Land Use Map. This use is to be architecturally sound and compatible with the community goals and visions associated with this document. Some mixed uses of this zone may be allowed in the future in certain areas along the highway, providing that residential uses are not adversely interfered with or disturbed by the use proposed. A Mixed use area is designed to accommodate future development near the city core. The development in this area may be a compatible mix of commercial, lodging and residential uses. This land use is similar to the Commercial/Retail use described above but differs in that wholesale and or light manufacturing of products are allowed with less public accesses associated with the use. The types of business and plants in this use are relatively small and should be as environmentally clean as possible. A small park setting is most desirable. The plants, offices or buildings located in this classification must be architecturally compatible with the character of the City as defined in this General Plan. Medium to heavy industrial uses would be more compatible outside the City of Oakley. This land use is similar to the low density agricultural but is imposed on lands controlled by the U.S. Forest Service or land in mountainous or remote and rugged terrain that would not be efficiently serviced by public infrastructure. This use would have an extremely low residential density associated with it and would always be part of a sensitive lands overlay type of zone. These areas are dealt with by creation of an overlay type zone imposing additional requirements to the other land uses listed above. These sensitive areas are assessed in new development applications by thorough study and analysis by the developer and City, with the use suitability and mitigation measures if necessary, determined. These requirements are in addition to the requirements imposed on any land use or zone regulations that may exist below the overlays. Other smaller areas of sensitive lands or hazardous lands may be discovered as new development(s) are applied for or areas are investigated and will also become subject to the regulations specified in the Land Management and Development Code of the City. The Land Suitability and Critical Lands Map(s) (when prepared) are to be a series of maps and a compilation of the overlaid maps into one general map that define lands that may not be suitable for development or use restrictions should apply. The compilation defines all areas from the individual maps and these areas become the major areas of the Sensitive Lands Overlay Zone in the Land Management and Development Code and Zoning Map and uses in these areas become subject to that portion of the code and its restrictions. Data for these maps comes from various State, Federal and County Studies and may be updated as new data is made available. These maps do not define ALL areas subject to the Sensitive Lands Code, only the obvious. Other small areas may be deemed appropriate for application of the Code on a closer examination and on a development case by case basis. While Oakley City is still a relatively small community, the value of a strong local economy cannot be over emphasized. There must be some place for local residents to work and contribute further to the build up of the Oakley economy. A healthy commercial economy starts by encouraging business and not making business licensing a major task or financial burden for small business and ends with local jobs and a healthy tax base for the City. SUPPORT NEW BUSINESS AND LIGHT MANUFACTURING OR INDUSTRIAL USES AND PROVIDE OPPORTUNITIES FOR THE PRESERVATION AND ENHANCEMENT OF SUSTAINABLE AGRICULTURE AND OTHER SMALL BUSINESS OPERATIONS IN THE CITY. Provide appropriate land use opportunities for commercial, light manufacturing, industrial, service related and tourism businesses that will result in a diversity of economic opportunities for the Oakley area. Create at least one light industrial and manufacturing area plus a commercial area and develop zoning regulations governing the acceptable uses associated with small retail/service businesses and manufacturing industries. Encourage commercial development that capitalizes on existing tourist and visitor traffic, but is reflective of the community’s western character. Promote the development of small home based businesses or clean cottage type industries that have very minimal impact on City services or land uses, i.e. traffic, noise, parking, etc. Allow certain areas to be developed for small environmentally clean industries that can be compatible with agricultural or rural type land uses. Make small home businesses that require no off-street parking, signs or visible or audible characteristics a permitted use in some residential and agricultural zones. Regulate the development, as much as practical, of commercial areas for improved appearance, protection of adjacent property, preservation of street function, provision of off street parking, and efficient use of municipal services. Establish and regularly update strong architectural controls and site planning standards for all new commercial areas. Deny non-compatible and disruptive land uses in commercial areas. Regularly examine and update parking access regulations to meet present and future needs. Provide adequate infrastructure sized to support commercial development and anticipated needs. Coordinate commercial development with City, County and State transportation planning. All commercial development in the City will reflect and promote Oakley’s identity and character. Commercial developments located adjacent to each other should blend harmoniously together. All ordinances and commercial standards adopted by the City should reflect the City’s identity and personality, and work to eliminate or improve cluttered, aesthetically unpleasant commercial areas. The City should adopt a sign ordinance, regulating the size and placement of all signs in the City. Encourage the placement of all underground utilities in commercial areas. Implement the use of access roads, and combinations of space and landscaping to isolate high volume, high speed traffic from low volume, low speed traffic areas. In 2002 Oakley adopted an Annexation Policy Declaration. The City Council has determined that the designated area around the City may be suitable at an unspecified time for annexation, if in the City’s opinion, the land would benefit the City as a whole and not tax existing residents to service it. A concern of the City is that rapid unincorporated growth around the City may eventually rob the City of its western character and may be annexed in the future by a Council more intent on receiving the higher Tax Base. This rapid growth may affect the City’s water quality and quantity as well, even though no direct connection is made to the City’s infrastructure. Also, rapid unincorporated area growth could drive the City into a regional sewer district prematurely. If areas are annexed, it would be better to annex them in an undeveloped state, so that the City’s General Plan and Development Codes may have a greater effect on the future destiny of the land uses. Another critical issue is that development in County sensitive land areas or aesthetic view areas, such as the north hills, east foot hills and river bottoms can also have a detrimental effect on the character of Oakley, and result in developments that sprawl ridge tops and mountain sides. It becomes evident that joint cooperation with Summit County is an essential goal when development is proposed around the City to ensure that proper impact reviews and analysis are performed before approval or annexations are finalized. ENCOURAGE COORDINATION WITH SUMMIT COUNTY AND OTHER LOCAL GOVERNMENTS IN THE SOUTH SUMMIT AREA TO ENSURE THAT THE CITY’S GENERAL PLAN GOALS ARE MET AND THAT DEVELOPMENT BEYOND THE CITY’S BORDERS THAT MAY HAVE A GEOGRAPHIC OR ECONOMIC IMPACT ON THE CITY ARE KEPT COMPATIBLE WITH THE CHARACTER OF OAKLEY. Communication with Summit County, the School District, Fire Protection District and other local jurisdictions will assure that development occurs in an orderly manner and protects the interests of the City of Oakley. Enter into inter-local agreements with the County and other Governmental organizations in the South Summit area who would be willing to enter into joint planning efforts in the outlying border regions or future annexation areas of Oakley City. Coordinate with property owners to explore ways in which the City could participate with landowners to protect and enhance the City’s entry corridors. Provide this general plan as well as other information on the City’s boundary line goals to residents in those areas and start a line of joint communication with them in the planning process. Community design is the process by which the functional and visual relationships between people and their physical environment are planned and implemented. Community design standards are usually established and implemented through a City's zoning and development ordinances, sign regulations, site plan review, and other review and permitting procedures. Developers usually retain the greatest influence over the design of their projects. However, the City government can directly influence land use, architecture, green space, street and transportation improvements, and landscaping of private development through design guidelines. The goals and policies of the various elements of the Oakley General Plan have been established to encourage, via the planning process, orderly growth and development and high standards for community design. The Oakley Planning Commission studied certain aspects of community design which, if implemented, would greatly enhance the identity and aesthetic appeal of Oakley. Maintaining a western flavor to architectural design is important, especially around the central commercial district of the City. Country and western ranching themes should be encouraged in building design. Certain improvements on entry streets would serve to identify City boundaries and create a favorable "first impression" of Oakley. The Oakley Planning Commission and City Council can encourage "above average" property design and maintenance. City ordinances should also require site compatibility with respect to signs, buildings, setbacks, landscaping, and parking areas. Proper conservation subdivision design can encourage buffering of residential neighborhoods from major travel corridors as well as improve the aesthetics of these corridors for the motorist and pedestrian. To be effective, good community design must be achieved at each of three scales. At the City scale, community design should have features and characteristics that will unify and help provide a sense of the physical and social community. At the neighborhood scale, community design should offer many opportunities for improvement of neighborhoods and of institutional, light industrial, and commercial districts. Opportunities will be provided to create many new unifying focal points, to strengthen boundary features, to recapture and recall elements of historic or natural importance, to maintain the character and attractiveness of older neighborhoods and farms, and to introduce desirable interest and variety. At the individual project scale, country and community design standards can be applied to private or public buildings, streets, landscaping and parks as well as fences and signs. Oakley’s physical image and enhancement of that image through good design are important to the economic well-being and the quality of life within the community. For Oakley, good community design should be accomplished at each of three scales. A Community design plan should be formulated, even if it is a simple one at first. Neighborhood plans and public and private projects must reflect community and small city agricultural values and objectives. The following goals and objectives should be implemented through ordinance revision or design, site and plat review and capital improvement planning. TO PROMOTE AND FOSTER THE CONCEPTS OF GOOD COMMUNITY DESIGN AT THE CITY, NEIGHBORHOOD AND INDIVIDUAL PROJECT LEVELS, AND TO STRENGTHEN THE AGRICULTURAL SMALL CITY IMAGE OF THE CITY OF OAKLEY. Through the development review and site plan approval processes, require quality developments that improve the livability of the City and its quality of life for City residents. Strive for harmony and unity between individual development projects. Landscaping and coordinated tree plantings can do much to unify adjoining developments. Locate development in configurations and in areas that will preserve and enhance green space character and a western atmosphere in the community. All efforts should be made to screen mechanical equipment, parking, and storage areas from public view. All setbacks, fencing, and landscaping on arterial or side streets should be consistent and create a unity throughout the City to strengthen the City's identity. · Separate residential and non-residential uses by permanent, easily maintained walls, solid fences, and combinations of space and landscaping. · Develop and update design standards for all commercial developments. · Improve the visual quality of all commercial areas by requiring the use and proper maintenance of appropriate landscaping. · Development on major thoroughfares should blend harmoniously together promoting a country theme of oneness and unity. For all developments recognize that street improvements and streetscape play an important role in the City’s identity. Building setback, park-strip requirements and treatments should be sufficient and appropriate to create an aesthetically pleasing and functional streetscape. The design of streets and street improvements should be evaluated from both aesthetic and functional perspectives. Elements of the streetscape may include traffic control devices, signs, lighting, medians, curb and gutter, pedestrian crossings, parking strips, and landscaping. All City street signage should be attractive, well maintained and functional. Major gateways into the City or developments in the City should be identified, protected and enhanced in order to emphasize and preserve the character and appearance of the community. · Implement and monitor a sign control ordinance capable of protecting the City from the negative impacts of visual blight. · Provide adequate, visible, and attractive street signage. · Recommend street design standards for each street classification. · Develop, maintain and recommend a standardized streetscape for Oakley. This streetscape should set "the" standard and address the items of street lighting, tree planting, signage, set-back and berm requirements for each street classification. · Provide attractive, landscaped entry treatments at all gateway entrances to the City. · Require the installation of low maintenance fencing and natural or native landscape materials, which provide an attractive visual barrier to subdivision lots which back on side arterial streets. Recognize that the people of the City of Oakley are our greatest asset and define the most important quality and character of the City. Encourage citizen participation and civic organizations to participate in City planning and development activities. Especially, continue to support and work with the Oakley Civic Club and the Kamas Valley Lions Club to further the civic spirit and goals of the City. TO PROVIDE AN ADEQUATE, SAFE, AND HEALTHFUL RESIDENCE FOR CITIZENS OF THE CITY AND TO ENHANCE THE COMMUNITY'S IDENTITY AND SHAPE ITS COUNTRY CHARACTER. TO ESTABLISH HIGH STANDARDS FOR RESIDENTIAL DEVELOPMENT AND MANAGE GROWTH OCCURRING WITHIN THE CITY. TO PRESERVE THE IDENTITY OF OAKLEY AS A FAMILY-ORIENTED COMMUNITY WHILE PROVIDING A RANGE OF HOUSING TYPES, STYLES, AND PRICE LEVELS IN THE CITY. Adopt the Green Space and conservation subdivision concepts of City planning and development as the basic pattern of growth for Oakley. Locate public buildings, such as elementary schools, churches, etc., so they form the nucleus or center of each neighborhood. Neighborhoods should be bounded by major thoroughfares or natural features such as agricultural, cultural, ecological and recreational space. Residential areas should be grouped into neighborhoods and planned in relation to schools, playgrounds, parks, green space and other facilities. Major thoroughfares and other man-made barriers should not disrupt neighborhoods . Develop and implement standards and policies that promote desirable characteristics in residential areas. Adopt and enforce ordinances requiring landowners to keep their property free of weeds, junked vehicles and equipment, unsightly buildings, trash, and other debris. Local government will require the maintenance of green space and park areas to minimize blight and unsightly residential areas by requiring development agreements. Schools, churches, libraries, fire stations, and other public buildings and structures, located in residential areas should provide attractive and well maintained landscaping. Protect and enhance residential amenities when possible by reducing conflicts with adjacent uses. Provide safety in and accessibility between residential areas. Design of new residential areas should use loop-type streets, and frontage roads to create neighborhoods free of dangerous intersections. Provide safe and convenient pedestrian routes from home to school. These routes should use a combination of green spaces, roads and trails. Require developers to study and provide protection for development in areas of high ground water or flooding by using environmentally sensitive subdivision layouts and building designs and remediation measures. Require adequate off-street parking for guests and recreational equipment in residential subdivision areas. Enforce City ordinances requiring the adequate piping of irrigation ditches and the fencing of irrigation canals in residential areas. Increase community pride by improving the appearance of all residential areas. Require street-side landscaping for each lot in new subdivision areas. Develop and implement a shade tree and landscape ordinance to encourage a quality urban environment. City-wide beautification programs should continue to be encouraged and supported by the City to strengthen citizen pride. Promote compatible, aesthetically pleasing architecture and western countryside or mountain community design in residential areas. Encourage single-family detached, owner-occupied housing that meets minimum standards for new developments. Develop minimum design standards in the Land Management and Development code to address densities and aesthetics in housing design and construction. Manage the timing of residential development so that adequate streets, water, sewer, drainage facilities, schools and other essential services can be economically provided. Permit development to the degree that it can be served by the City's resources without impairing them. Subdivision of land will be in accordance with the General Plan, Land Management and Development Code and the Green space Design as well as applicable infrastructure master plans in effect and directed by the standards set. Area studies should be prepared by developers showing the relationship of the subdivision to the neighborhood of which it is a part. Access to the general street system, schools, recreation sites, and other facilities and services should be shown along with green space system integration that may affect adjacent property owners. All development projects must be sequenced and built concurrently with infrastructure or services required by the development. Control the quantity and quality of multi-family housing units. The proportion of multi-family housing allowed will not exceed ten percent of the City's total dwelling units, unless otherwise recommended by the Planning Commission and approved by the City Council. Locate multi-family developments in or near major activity centers and adjacent to transport nodes. Arrange multi-family structures in clusters rather than in long strips fronting arterial streets and avoid facing single-family residences. Require the highest standards of design, function, and appearance for all multifamily developments. Building styles of multi-family developments should be compatible and harmonious with surrounding and adjacent green space and surrounding and adjoining buildings. Multi-family developments will be required to have a high proportion of brick, stone or wood construction. Multi-family developments should contribute to the city’s green space. Condominium projects will only be permitted in master planned development areas. Ensure that private property rights of all property owners are preserved and guaranteed. Establish policies which are in compliance with adopted ordinances and assure property owners that decisions will not be made in an arbitrary nor capricious manner. Decisions involving housing and housing policies should be made within the framework of the goals and objectives of the General Plan. City revenue needs, economic pressure, or developer "whims" should not be allowed to compromise housing policies or standards. A major consideration for approval of subdivision and residential projects should be their effect on adjoining and surrounding uses and that they will not hinder operation of agricultural functions. Development should always pay its own way. Maintain flexibility in land development standards consistent with good design and efficient function. Continually review and revise zoning and subdivision ordinances to assure that creative solutions to development are not precluded. Provide flexibility in subdivision development agreements to allow for creative use of residential lots while maintaining land use densities. Encourage high quality country design throughout the City. Encourage use of vacant lots within existing residential areas. Provide a reasonable choice of residential types throughout the City. These choices include single family homes, multi-family apartments, condominiums and manufactured homes. Not included in this objective are mobile homes and parks which offer transient type housing. Mobile home parks will only be allowed where single family and multi-family developments are not feasible and where conflicts do not occur with surrounding commercial, industrial, open space, or other uses and should be considered on their individual merits. Manufactured housing will be permitted in all areas of the City provided it meets all standards and codes. Group homes will be permitted only if they comply with the residential character of an area. Development applications for group homes will be assessed on their individual merits. Develop an affordable housing requirement to ensure housing that is affordable by low income persons, while maintaining high standards in construction and characteristics. The City of Oakley has formulated the following goals and policies to provide direction in decisions regarding transportation planning and development. TO DEVELOP A UNIFIED TRANSPORTATION SYSTEM THAT PROVIDES FOR THE ECONOMIC, EFFICIENT, COMFORTABLE, AND SAFE MOVEMENT OF PEOPLE AND GOODS IN AND THROUGH THE CITY. To ensure that the City's transportation system and future plans meet present and projected demands. Incorporate transportation planning as an integral and vital part of the comprehensive planning process. Use a cost-effective method to obtain good quality transportation planning. Continually monitor and evaluate the road system to ensure that proposed and existing roads and road designs will adequately meet the demands of the community. As directed by the Oakley Streets Master Plan, reserve the necessary right-of-ways to meet the road's ultimate function in the system. Develop and annually update a Capital Improvements Program to meet the transportation demands of City residents in a timely and cost efficient manner. Educate all City residents about and solicit their support in the formulation and development of an on-going road and trail capital improvements program. Maintain a close cooperation with the Utah Department of Transportation to improve all state roads and their safety within the City. All street improvements should be in harmony with state plans and requirements for future traffic service. Work aggressively for the construction and completion of all necessary road improvements. Continue to lobby for federal and state funds to meet the transportation needs of the City. Consider and evaluate, based on cost-effectiveness and need, participating with the State for the improvement of the state road system within the City. The City will maintain and regularly update street construction specifications to prevent premature street deterioration. The City will not accept for dedication any street constructed at below standards. To ensure all streets meet construction specifications the City will maintain a high level of engineering inspection services. To improve the safety of all City streets and intersections. Develop, recommend and enforce street design standards to encourage higher levels of safety on all City streets. Widen, improve, or replace bridges which are obstacles to traffic flow and safety, as economically feasible. Adopt an on-going street marking (signage) program to ensure street markings are clearly visible. Improve the safety and aesthetics of City streets by ensuring the arterial and collector road network is well lighted in compliance with the city lighting ordinance. Encourage law enforcement to vigorously enforce City speed limits, especially near residential areas. Provide adequate space in subdivision design to allow safe and orderly vehicular and pedestrian movements throughout the neighborhood and adjacent green space. Work closely with the South Summit School District and other organizations, in selecting locations for schools to minimize the necessity of children crossing arterial roads. Protect children at crossings, particularly near schools and recreation areas. Provide the highest level of public safety possible to prevent traffic accidents. It is the intent of the Oakley General Plan to create an integrated system of cultural, ecological, developmental, agricultural and recreational (CEDAR) spaces constituting the city’s green infrastructure, which is reflected in the city’s Green Space Design. The city has conducted studies with the Center for Green Space Design and Mountainland Association of Governments to more completely understand the qualitative and quantitative nature of the city’s green space types. To further the goals and policies in the General Plan Elements, the city is promoting green space preservation through the subdivision and zoning ordinances. To use the subdivision ordinance in the city’s effort to produce green infrastructure. Develop a green space ordinance and/or overlay zone that would require detailed C.E.D.A.R. impact statements or other studies to be performed by developers in these areas. The results of these studies would determine appropriate remediation, building capacities and/or impose appropriate development restrictions on projects influenced or sited in geological hazardous areas, areas of high erosion potential, wet lands, high water table areas and flood plains, wooded river bottoms, unsuitable building soils, and hill sides with slopes greater than 30 percent, critical wildlife habitats, high vegetation/fire danger, water shed protection and other sensitive lands or issues. Open space useable for agricultural purposes should be maximized or encouraged, hillsides and ridge tops should be protected as view areas or vistas and not developed. Such open space should be permanently preserved by conservation easements with a City approved Land Trust. Strictly implement the land use objectives in this element of the General Plan by developing appropriate City procedures, ordinances, codes and regulations in the Land Management and Development Code of Oakley City, developing a Land Use Map, Green Space Design, Land Suitability or Critical Lands Map and Zoning Map. Also develop any necessary accessory ordinances to manage growth and development in the manner prescribed. Work with Summit County through an inter-local type agreement to ensure that Oakley’s Land Use objectives are preserved in the sensitive lands areas just outside of the city boundaries. Incorporate good planning principles into future developments that result in some “public good” by clustering lots so as to provide generous common open spaces, making land more farmable or optimum for agricultural uses, minimizing the number of driveways on public roads, building the most suitable sites and minimizing the visual impact of the development by using generous setbacks and trees and shrubs as buffers. Enhance the visual character of residential areas and provide for the preservation of environmental values. Encourage the creation of residential areas which are sensitive to natural features and environmental constraints. Protect environmental values by using master planned developments, which provide and maintain permanent green space, are harmoniously integrated with agricultural areas and preserve overall density requirements. Encourage the preservation and enhancement of areas that should be maintained for scenic, historic, conservation, or public health and safety purposes. Require the use of underground utility lines where feasible. To provide a network of pedestrian, equestrian and bicycle trails throughout the city, including sidewalks, walkways, bikeways and trails. This network will be a part of the green space system to the maximum extent possible. Establish and maintain a safe network of bicycle routes and pedestrian trails, which connect activity centers in the City. Activity centers will include, but are not limited to, schools, churches, parks, arenas, public buildings and shopping centers. In all new residential areas, sidewalks or an acceptable trail system will be the standard. In cases where the sidewalk is located directly adjacent to the curb and gutter, the minimum sidewalk width should be six (6) feet. The requirement for, and location of sidewalks in industrial areas will be evaluated and determined by the Planning Commission. Require pedestrian and disabled persons access to, and within, all parts of commercial developments. Recognize the provisions of a bicycle, equestrian and trail network as a valuable community asset. Preserve all areas, including sensitive lands that may be suitable or required, to develop this system through currently adopted trails plans. Adopt a city and regional trail master plan to study and identify where future trails may be safely installed concurrent with development and not jeopardize agricultural uses in the city. The Green space Design/CEDAR maps shall be an integral part of the developer’s site analysis process and shall be the basis for conservation subdivision design with C.E.D.A.R elements. Absolute and relative green space shall be clearly identified on CEDAR site analysis maps. City staff will consult with developers on this determination. Use the zoning ordinance in the city’s effort to produce green infrastructure. The city’s zoning technique provides landowners with a series of options to produce land conserving subdivision and site designs, and dissuades land-consumptive layouts that divide all the acreage into parking lots, building footprints, suburban house lots, and streets. For each of three residential zones, three alternative choices, or “Series”, are offered: a base-density alternative, a low-density alternative, and two higher-density options. The base-density option would create the same number of lots attainable under conventional zoning with the equivalent minimum lot size. To obtain this full density, developers would submit a conservation-style design, in which lot area is reduced in comparison to conventional zoning, in order to permanently conserve a large portion of the unconstrained land in common green space. Developers choosing to leave a larger-than-base percentage of the unconstrained land as undivided green space would receive a density bonus, i.e., more lots. To encourage landowners to consider creating larger lots or mini-farms (one principal dwelling per ten acres), a low-density “Estate Lot” Series is included with no unconstrained green space required. Analogous to the concept of residential density in residential green space design developments is the concept of floor area ratios in nonresidential green space developments, i.e., commercial projects. Developers would be given a base-level floor area ratio, a minimum percentage green space (above and beyond constrained land), and related standards to be met in their projects. Density bonuses, in terms of increases in the allowed floor area ratio, would also be possible in exchange for increased green space or other project enhancements. Create CEDAR (Cultural, Environmental, Developmental, Agricultural, Recreational) Land Preservation Standards. CEDAR Land Preservation Standards are a variation on earlier “density zoning” or “performance zoning” techniques. This technique excludes the most culturally and environmentally sensitive lands from development. Depending on the specific type of land sensitivity, restriction can prohibit construction, grading, and clearing. “Net-Outs” of constrained land are subtracted from the total property to arrive at the buildable acreage for purposes of calculating the number of lots or the commercial building square footage the property may contain. The percentage of constrained land that is netted-out of the maximum lot or square footage calculation varies by the type of land sensitivity present on the property. For optimum placement of house sites and to limit the percentage of the development parcel that is converted from woodland, meadow, or farmland to suburban lawn, CEDAR Land Preservation Standards have been combined with the city’s green space subdivision design techniques as described under “Promoting Green Space Preservation Through the Subdivision Ordinance” below. Use “Landowner Compacts” to analyze the green space context of properties adjacent to proposed developments. A landowner compact is a voluntary agreement among two or more contiguous landowners essentially to dissolve their shared, internal lot lines (for planning purposes) and to design their adjoining land holdings as if a single parcel. Areas for development and preservation could cross property lines so that they would produce the greatest benefit, allowing development to be distributed in ways that would preserve the most buildable part of the combined properties. Taking a very simplified example, all of the development that would ordinarily occur on three adjoining parcels could be grouped on the land containing the best soils or slopes or having the least significant woodland or wildlife habitat, potentially leaving the one parcel entirely undeveloped. The three landowners then share net proceeds proportionally, based on the number of house lots each could have developed independently. To use transfer of development rights (TDRs) to create inter- city shifts in development locations. TDRs are inherently limited to playing a partial role in preserving a city’s undeveloped lands, and are viewed as a tool for only occasional use. The basic purpose of a community Green space Design is, in effect, to precisely identify those area which in a TDR system would be sending areas, and in the process identify, based on solid planning principles and well-thought-out local priorities, those areas to receive development. The city’s TDR technique has been combined with detailed design standards to control the appearance of the areas designated to receive the additional development rights. The “receiving areas” represent an excellent opportunity to provide a diversity of housing types that sit comfortably together on the same block because they share a similar architectural style or expression, as was often the case in the older settlements laid out and built in Western communities. Where TDR is to be used, the implementation of community-wide Green Space Design will ease the decision-making process of receiving areas because it will be within the context of an overall green space system, which includes separators. Create a Purchase of Development Rights (PDR) program for the city. The city’s purchase of development rights is inherently limited as an area-wide green space preservation tool by municipal budgets already straining to provide basic services. However, PDR’s provide an excellent way for the city to conserve an entire high-priority parcel or vital connecting link in the city’s Green Space Design on an occasional basis, and for this reason the city can play a critical supporting role in protecting individual properties of great local significance. Their advantage is that they typically protect whole properties, while green space design protects a large portion, but well short of the entirety of the parcel. Some communities have found widespread public support for proactive green space preservation and have established special property tax levies or sales tax surcharges earmarked for acquisition. Use Limited Development scenarios in situations where extraordinarily large amounts of green space are desired. In those situations where it is highly desirable to preserve more green space on a property than is required by the standards of the zoning ordinance (this would typically occur where the City’s Green Space Design call for preservation of an extraordinarily large portion of a relatively small parcel and/or where the applicant’s property is located near the edge of the City’s corporate limits and is designated on the Green space Design Map as a community separator), hybrid combinations of the above techniques may be used. The combined use of PDR, TDR, landowner compacts, land conservation design, and other tools frequently can condense development and thereby increase the green space quality of a development while maintaining or even enhancing the economic returns. The term limited development as used here is meant quite literally, as far as limiting the disturbed proportion of a site is concerned. A limited development scenario is typically one where 60 percent or more of a property’s acreage ought to be preserved green space. The path toward limited development on a site begins with a yield study to determine the number of dwelling or the nonresidential building square footage allowed after netting out the constrained land. Then the development is sketched out taking into account the CEDAR elements of the particular site and the green space standards of the zone in which the property is located. If during this sketch design it becomes apparent that important CEDAR resources on the site exceed the acreage to be preserved by zoning requirements and that the allowed dwellings or building square footage cannot reasonably fit on the parcel without disturbing important CEDAR resources, then the applicant and the City would purse a process of negotiating a creative solution. Of course, in order for these negotiations to occur, the other techniques described above would need to be permissible under City ordinances. Typically a negotiated solution allows at least some portion of the dwellings or other building to occur on the subject property. The remaining development or development rights normally attached to the property can be managed various ways. Such remaining development or development rights could simply move to an adjoining site or be applied in a more suitable “receiving” district somewhere else. The rights would most likely be quantified as “unit equivalents” and could be converted into higher or lower density forms of housing than would have been allowed on the subject property , or even quantified by some method as equivalent commercial square footage. These negotiations would likely occur only under such unique circumstances and so infrequently that City ordinances should allow the negotiating parameters to be quite broad. Use Green space Design/CEDAR Maps to assist in the creation of conservation subdivisions. Topography, the boundaries of flood plains, and locations of wetlands are typical base information drawings that have long been required as part of the development review process. In recent years the list of features has expanded to include other resources identified in the city’s sensitive land and natural resource elements. The City’s Green Space Design base maps that have emerged from the CEDAR approach, somewhat similar to the Community resources and site Analysis Maps that some communities have employed in recent years, identify, locate, and describe noteworthy CEDAR features to be accounted for in conscientious development design. The traditional site analysis maps for individual developments can now be augmented with very detailed but affordable CEDAR analysis maps, based in large measure on the City’s refined Green space Design map. These maps define buildable areas by pointing out features which development should avoid, such as prominent vegetation features; farmland soils rated prime or of statewide importance; historic resources; wildlife habitat; cultural features (such as view sheds along roads and hillside, farmhouses, barns, spring houses, stone walls, cellar holes, Indian trails, and old country roads); unusual geologic formations; recreation corridors; and future sites for recreation facilities, future cultural facilities and educational sites of various types. In conventional large-lot subdivisions, a few of these CEDAR elements can occasionally be conserved through sensitive street alignment and by drawing lot lines so that particularly large trees, for example, are located near lot boundaries and not where houses, driveways, or septic systems would likely be sited. However, the City’s adopted Green Space Design creates the hierarchy of these character-defining features in order that the most important ones can be preserved or developed around. Flexible site design in which lot dimensions can be substantially reduced offers the greatest potential to conserve these special places. This holds true in nonresidential as well as residential developments. Use a Pre-Sketch Conference and Site Visit to start the design process. Development applicants should meet with City officials or their staff informally, even prior to preparation of a Sketch Plan, to discuss ideas for their properties and to walk the land with the CEDAR analysis maps in hand. This meeting can expedite the review process by helping everyone become familiar with and share ideas on the design-shaping site context issues earlier in the process. Use Sketch Plans to communicate development ideas. Sketch Plans are basic drawings that illustrate, in the most conceptual terms, designs for commercial pads, house lots, streets, industrial building, and preservation areas. They should ideally be based closely on the City’ Green Space Design map, CEDAR analysis maps, and comments received from local officials during the pre-sketch conference and site visit. Developers find the Sketch Plan process to be a fruitful effort because it helps them to clarify and design for community concerns in an informal setting before spending large sums on detailed engineering and waiting to get on a Planning Commission agenda. By contrast, if more highly engineered plats are the first documents the local officials see, the development review process misses crucial opportunities for dialogue and information exchange at the very point when it is most needed during those first weeks when the overall design is still most flexible and open to easy modification. For Sketch Plan review to be effective, however, it is vital that City staff conducting the review be attuned to Planning Commission and City Council issues and priorities so that they can present City positions on design issues with a high level of certainty. Other wise, Sketch Plan review is an unproductive exercise and may even be detrimental, if it directs the developer in a design direction that is contrary to what the City would ultimately approve. Use CEDAR Style Development Design to create conservation style developments. The term CEDAR style development design describes a new form of development in which, in addition to avoiding wetlands, flood plains, and steep slopes, much of the flat, dry, and otherwise buildable land is preserved from clearing, grading, and construction and yet the developer is able to achieve full-yield density be reducing lot sizes and intensifying development on the remaining developable land in other ways. CEDAR style design offers a cost-effective way for the City to preserve its prime CEDAR elements identified in the Green space Design portion of the City’s General Plan. It is a highly useful tool when undertaken in combination with other preservation efforts possible through State, County and City acquisition programs, which can be limited in scope. CEDAR development design applies to nonresidential as well as residential development, infill sites as well as Greenfield sites. Because CEDAR elements exist to some degree on virtually all lands, there are few, if any, situations in the city where it will not improve the quality of the developed landscape. Consequently, CEDAR style design is not an approach to be limited only to certain areas of the City. The CEDAR design approach is consistent with Constitutional law regarding “takings” because landowners retain reasonable economic use of their property. Furthermore, developers enjoy the full density allowed on their properties under the zoning ordinance, and the common green space land typically remains in private use and ownership by homeowner association or other forms of ownership. Where green space comes under public ownership and/or use, it is normally with the voluntary, mutual consent of the developer and the City. CEDAR style development design differs from conventional development “clustering” in three important ways. First, it set multiple standards for the quantity, quality, and configuration of the resulting green space. CEDAR style developments frequently set aside 50 percent or more of the land as permanent, undivided green space. And unlike most cluster provisions, this figure includes only the acreage that is free of major development constrains (dry, flood-free, not steeply sloped, not possessing other highest-priority CEDAR characteristics). Following the green space design approach, the City’s most important ecological resources, farmland, woodland resources (including terrestrial habitat), historic and cultural features, and recreational amenities are preserved. A second advantage of CEDAR style development over conventional clustering is that the City can exercise greater influence on the CEDAR style design. Rather than leaving the outcome purely to chance, there are strong incentives to follow a flexible design approach where the General Plan, including Green space Design, has identified the location of CEDAR resources. The chief incentives are density bonuses for land-conserving design and density disincentives in doing land-consuming layout of large lots without green space. The third advantage is that the preserved land is also configured as part of an overall City plan to create an interconnected network of green space throughout the community wherever practicable, linking CEDAR resource areas in adjoining developments and/or providing buffers between new development and preexisting parklands, woodlands, farmlands, game lands, wildlife corridors and refuges, or land trust preserves. Use a Four-step Approach to Designing Land-Conserving Developments, thereby yielding large areas of green space. The majority of subdivisions, and even many developments that do not involve subdividing, are prepared by civil engineers, land surveyors and other professionals whose training and experience typically do not include a strong emphasis on conserving the CEDAR-type elements inherent in this type of development. Therefore, the city’s subdivision and other development ordinances explicitly describe the steps involved in Designing CEDAR style projects. In addition, the ordinance includes a provision requiring that all subdivisions containing more than 4 lots must be prepared by a team including a landscape architect and an engineer, and be based on a qualified survey. The sequence of the four steps in the CEDAR design process is critical. The first step is the identification of “Absolute” Areas. These include both the unbuildable lands (wet, flood prone, steep) and other most-significant CEDAR elements that in conventional development design typically would not be earmarked as features to be designed around. The first step also identifies the “Relative” Areas—richly vegetated lands, large trees, prime farm land, ecological meadows, upland habitat, historic buildings, geologic formations, and scenic views (particularly from public roads), and planned recreational and cultural sites. In identifying Absolute and Relative Areas, this design approach seeks to accommodate those special places both existing and planned for the future, that make each community a distinctive and attractive place. Green space design with its CEDAR analysis is well suited to implementing both the intent and the spirit of the City’s objectives for open space preservation. Identifying these Absolute and Relative areas is a fairly easy task, once the CEDAR analysis Maps (described earlier) have been prepared. The City’s Green Space Design, with its prioritization of areas for green space preservation, applies to all areas of the City, be they industrial, institutional, commercial or residential. In the second step, once the Absolute and Relative Areas have been identified, (the most critical step of the process) in residential developments, house sites are located so as to maximize views of, and often direct access to, the preserved green space, enhancing the house sites’ desirability and value. Siting the homes in this manner provides developers with a strong marketing advantage compared with layouts where homes are boxed in on all sides by other house lots. Similarly, in nonresidential development the second step involves locating office and other building pads so as to maximize their leaseability with regard to views of the green space, access, visibility to customers, buffering, and continuity with development on neighboring sites. Somewhat more difficult with nonresidential projects is the accommodation of views into, through, and out of the site. Building mass tends to be larger, therefore in some situations calling for greater setback than with residential. Ample commercial building setbacks should be established in the ordinance, with provisions to adjust them downward if warranted when specific site plan with building mass comes before the city for review. The third step, aligning streets and trails, is almost a matter of ”connecting the dots” for vehicular and pedestrian access. In nonresidential development, including village mixed use-commercial areas, frequently there will be instances where civic nodes have been identified for future use, which nodes may spill into multiple developments. In such cases it is essential that the street-and-trail planning step provide for joint planning among neighboring parcels and sometimes even involve cost sharing discussions for certain extraordinary facilities of common benefit to all developers at the node. The fourth and final step of drawing in the lot lines typically involves little more than marking boundaries midway between house locations or, in the case of nonresidential development, filling in commercial lot lines and site design details. In nonresidential projects as with residential, flexibility and diversity in acceptable project types is the key to creating vibrant, successful communities through defensible City processes. Design guidelines assigned to specific locations of the City’s Green Space Design are essential and should be carried over into the four-step development design process. For example, street intersections where short and long range views are critical must be thoroughly described in terms of spatial analysis on all four corners. If the intersections covers parcels in multiple ownerships and is envisioned to have a civic plaza, perhaps a landowner compact should be used to allocate the development around the plaza while equitably distributing the costs and revenues. Following this four-step sequence creates a foolproof design guideline. CEDAR style design with the four-step approach has been institutionalized in City ordinances, providing the community with a reliable tool to help build its Green space Design System even when parcels cannot be protected in their entirety through donations, purchases, or techniques such as TDRs and limited developments. It is the intent of the Oakley General Plan that parks and recreational facilities and programs be developed and operated in a responsible manner. The following goal, objective and policy statements were established by the City as a guide in acquiring and developing park property and green space and in developing and maintaining an appropriate and comprehensive recreational program in the City. TO PROVIDE FACILITIES FOR A BALANCED PROGRAM OF PHYSICAL AND CULTURAL ACTIVITIES FOR THE RESIDENTS OF THE CITY OF OAKLEY AND TO PRESERVE THE ANNUAL FOURTH OF JULY CELEBRATION AND RODEO AS THE CENTRAL CITY CELEBRATION. Recognize that parks and green spaces are essential ingredients of both the physical and sociological environments. These areas not only provide opportunities for both active and passive recreation, but also increase the provision of a valuable City amenity. Continue to expand and develop the City's park, rodeo arena and recreational facilities to encourage City residents to stay within the City to participate in recreational pursuits . Sites for park and recreational facilities should be identified in advance of development and acquired or procured as soon as possible in all areas of the City. The City will reserve park and green space sites in developing areas while land is still available. Park development can come later but only if the land is there to be developed. At this time, emphasis must be placed on procurement or acquisition to ensure the availability of future park sites. Develop new and existing parks that meet the needs of young children, youth, families, groups, and the elderly. In developed areas, the provision of park, recreational, and other sites should occur on vacant land parcels or be provided as development takes place. Work with the school districts for the development of joint City-school recreational facilities. Strive to meet the present and future recreational demands of all sectors of the Oakley community. Identify and utilize a cost-effective method to provide high quality recreational planning for the City of Oakley. Develop and maintain a parks and recreation master plan for the City of Oakley. This plan should identify the location, purpose, and function of each facility. Employ progressive and suitable zoning and development techniques to generate park and recreation sites in appropriate locations. These techniques may include required park dedications, density zoning, property options, joint venturing with developers and property owners, cash donations, integration with the capital improvement program and other techniques. In the areas of the Weber River bottoms, north hills, City property and eastern forest service access, study the feasibility of a trail system to link these areas with a City park system and the center of the City. Cooperate and participate with Summit County for the coordination of recreation planning within the Oakley area. Strengthen and expand the recreational opportunities offered in the City by encouraging the County to locate more recreational facilities in Oakley. Open communication channels with surrounding communities to encourage intergovernmental cooperation to meet the recreational needs of area residents. Identify, pursue, and utilize all funding sources and development techniques that are available for park acquisition and development. Funding alternatives used to acquire and develop parks and recreation programs should include, but not be limited to, federal, state, and county funds, Community Development Block Grants, impact fees, user fees, donations, revenue bonds, general obligation bonds, special improvement districts, and special service districts. Assure that land and/or funds reserved for parks, green space, or other recreational facilities are not diverted to other community uses. · Providing "City-wide" recreational facilities, including the rodeo arena. Promote and solicit the donation of recreation and parks equipment by private and corporate organizations and recognize their support. Allow the private development of park and recreation facilities. Establish user fee schedules when an individual or group has exclusive use of a publicly owned recreational facility, including the City hall. These fees should be sufficient to operate, maintain, and restore the facility to its condition prior to use. Provide preferred rates to Oakley City residents, as they support the maintenance of the facilities through property taxes as well. Ensure that all City parks, buildings, land and recreational facilities are useful and attractive. Park and recreation facilities should be planned and designed to meet their proposed purpose. Park design and improvement must recognize the continuing need to provide high levels of safety in park areas. Protect park and recreation areas, including the City property from incompatible developments and uses on adjacent properties. Develop a City property recreation development plan to construct recreational type uses on a phased or annual basis as funds become available on the eastern City property. Work with the Forest Service and County to provide the best possible type of facility for the City. Maintain, in good condition, City property reserved for future park and public facilities through lease agreements and other creative maintenance alternatives. Through proper and appropriate site planning and design, seek to reduce operation and maintenance costs of park and recreational facilities. Oakley City is committed to protecting the Natural Resources that have enhanced its residential quality of life as well as the businesses of residents in and around the City. The people of Oakley represent the greatest resource in the City and all policies regarding natural resource management should be developed not only to protect the land, but to protect the health, welfare, safety, and enjoyment of the citizens of Oakley. Many factors contribute to the preservation of natural resources, not the least of which is protecting the farming and agricultural programs that have been developed by the farmers and ranchers in the area. Although the immediate consequence of this policy may not be realized, over a long term it will go further to develop an environment that is protected from outside development pressures and “over grazing” of homes than any other policy. Usually the farmers know more about long-term range and land management than any political entity may ever know. Other protection measures include detailed protection zones and mitigation measures developed by code, not only to protect the environment, wildlife and scenic views enjoyed by the residents of the City but also protection from geologic and other natural or man-made hazards. TO PROTECT THE NATURAL SCENIC, AGRICULTURAL, WILDLIFE, WATER, AIR, SOLAR, LAND AND HUMAN RESOURCES ABUNDANT TO THE AREA AROUND AND WITHIN THE CITY OF OAKLEY AND TO PROVIDE PROTECTION FROM NATURAL AND MAN-MADE HAZARDS ASSOCIATED WITH DEVELOPMENT IN SENSITIVE AREAS. Develop and maintain a “right-to-farm” policy for new and existing farmers and ranchers to protect agricultural uses from excessive or unmanaged residential or commercial growth. Protect agricultural access and farming rights by implementing buffers between producing farms and ranches and other incompatible developments. Require protections and easements in and around developments for irrigation and other watercourses, including land drainage systems. Encourage the development of a citywide secondary irrigation system to conserve water resources and more efficiently irrigate. Do not allow existing agricultural right of ways to become residential access corridors without proper improvements including measures and/or facilities implemented to protect future agricultural access. New residential development in active Weber river flood plains that are known to regularly flood during spring run-off seasons will not be permitted. Extend regulations and environmental impact statements or analysis to areas outside the Sensitive Lands Overlay Zone if the City staff, Planning Commission or City Council decides that a sensitive land area exists on a smaller scale or area outside the main overlay zones. Prohibit development in areas that are too sensitive or hazardous to be prudently and effectively mitigated using wise land management decisions and generally accepted environmental remediation or solutions. Develop a water conservation plan with accompanying regulations and requirements designed to encourage environmentally sound development. Encourage new subdivisions to develop water conservation plans and landscaping designs that use alternative planting materials and secondary irrigation systems. Develop a water rate fee schedule which penalizes property owners who do not practice water conservation techniques, such as xeriscape, drought tolerant plantings, etc. Develop a water ordinance with specific guidelines and regulations regarding the establishment and maintenance of private ponds, said pond may not include the use of culinary water. Enforce the city lighting ordinance to protect from the proliferation of light pollution. Enforce a lighting ordinance with specific requirements regarding lighting height, direction, luminaries, style, etc. Work with property owners to require existing lighting, which is in non-conformance to be replaced within 3 years of adopting the ordinance, as economically feasibility. Require new developments to submit lighting plans and impose compliance with those plans as per the building permit and homeowners protective covenants. Replace City owned streetlights with fixtures that comply with the adopted standards.